My younger sister came across this recipe here. It was a joint effort making this cake. Though she did more work than me. We worked together mixing up the cake ingredients. I baked it. 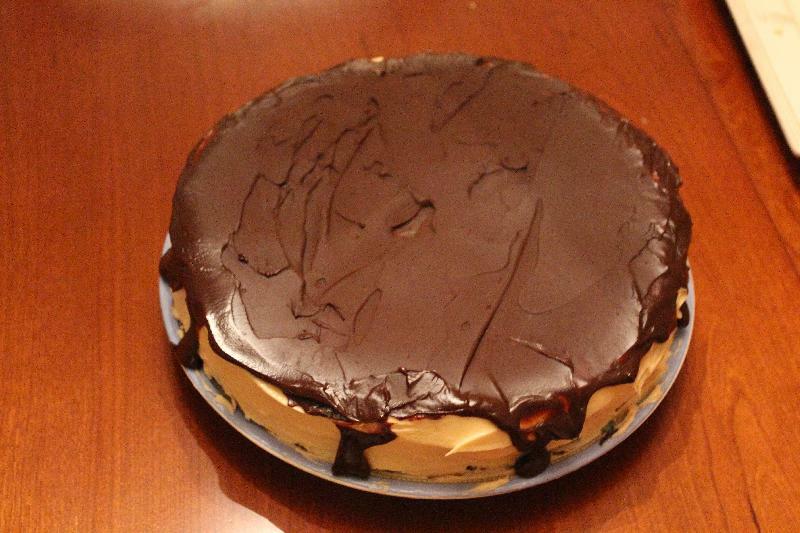 Then while I napped on Christmas day (hey I was exhausted from cooking all day) she made the frosting and ganache. My sister did not add peanut butter to the ganache and we didn't make this in layers, but it was still really really good! I love peanut butter and chocolate and this was perfect! I will say that I had run out of parchment paper and it was difficult to get this cake out of the pan. It is so very moist and delicate. This cake is worth the effort! 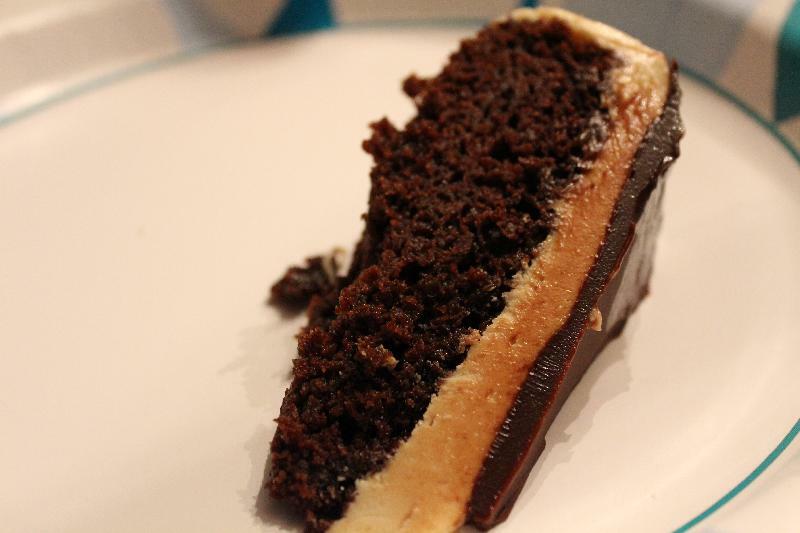 Next time I will bake it in 3 pans so that we can have the layers of peanut butter frosting! 2. Line the bottom of each pan with parchment paper and butter the paper. 3. Next sift the flour, sugar, cocoa powder, baking soda, and salt into a large bowl. Whisk the ingredients well. 4. Then add the oil and sour cream and whisk. 5. Gradually beat in the water. 6. Then blend in the vinegar and vanilla. 7. Whisk in the eggs and beat until blended. Scrape down the sides of the bowl mix the batter well. Divide among the 3 prepared cake pans. 8. Bake the cakes for 30 to 35 minutes, or until a toothpick comes out almost clean. 9. Then let the cakes cool in the pans for about 20 minutes. Invert onto wire racks and carefully peel off the parchment paper and let cool completely. You may want to place in the freezer or fridge so that they are not so delicate. 1. In a large bowl with an electric mixer, beat the cream cheese and butter until they are light and fluffy. 2. Gradually add the confectioners? sugar, 1 cup at a time. 3. Mix thoroughly after each addition. 4. Scrape down the sides of the bowl often. Continue to beat on medium speed until light and fluffy, about 3 to 4 minutes. 5. Finally add the peanut butter and beat until thoroughly blended. First place one cake layer, flat side up, on a cake stand or a large plate. Then spread 2/3 cup of the frosting evenly over the top. Then place the last layer on top and frost the top and sides of the cake with the remaining frosting. In a double boiler combine the chocolate, peanut butter, and corn syrup. Cook. Whisk Often until the chocolate is melted and smooth. Remove from the heat and whisk in the half-and-half. Whisk until it is smooth. To decorate the cake with the glaze place the cake on a large baking sheet covered in aluminum foil. Pour the glaze over the top of your cake and use a spatula to spread it evenly so it runs down the sides. Place in the fridge for at least 30 minutes to allow the glaze and frosting to set.